What’s wrong with a little gilt? A little jewelry, fanciness, lace, velvet, and champagne? Nothing, really. It just depends on how it’s done. I get these little girls in my library all the time requesting “princess” stories, and truth be told what they really want is something gorgeous to the eye. They’re the kinds of gals who drool over the Fancy Nancy books and sit hypnotized by the work of Kinuko Y Craft. Sometimes it’s enough to drive a good old-fashioned feminist up the wall. Not like I was any different when I was a tot, but wouldn’t it be nice to give a princess-obsessed child something gorgeous to the eye with a truly original concept, story, and look, but without the standard pretty pretty princess conceit? Is it wrong that I sometimes want to blow a four-year-old’s mind? 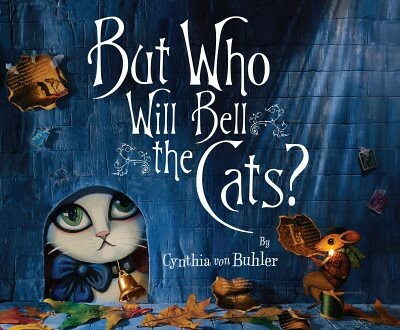 I’ve come to the decision that Cynthia von Buhler’s But Who Will Bell the Cats? is going to be my library’s secret weapon from here on in. I’ve already got my explanation at the ready. “Oh! You want a princess story? Have you read the one about the princess who owns eight beautiful cats and the little mouse who lives in the basement below?” It’s the old one-two punch. Lure ’em in with promises of princesses and kitties, then hit ’em with good storytelling and stunning visuals. They’ll never see it coming. The book begins with a quickie two-page recap of the old Aesop fable in which the mice decide to bell the cat. A couple pages later we read the real story. 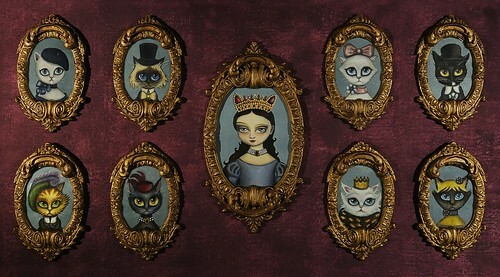 For you see there once was a princess who owned eight beautiful cats and doted on them all. Down below in her cellar there lived a mouse and a brown bat. While the cats lived in luxury the mouse and bat dwelled in the dank. The mouse then determines that his only course of action is to bell the cats and live in the prettier parts of the castle with them. The first time he tries it he wears armor. He fails. The second time he dresses up like a dog. He fails. The third time he puts on a fashion show for the cats and almost ends up in a pie before the princess walks in and saves both him and the bat. Finally, the mouse determines the best way to bell the cats. One that will allow him to attend the princess’s birthday party and live in the lap of luxury once and for all. And it’s all thanks to his crown-wearing partner in crime. From the title, a person might assume that this book was just going to be a longer interpretation of the old Aesop fable. After all, 2009 has seen several Aesop fables expanded into full-length picture books (The Lion and the Mouse, Lousy Rotten Stinkin’ Grapes, etc.). It actually came as a bit of a relief to find that von Buhler had gone a different route and just used the fable as a jumping off point. The story is original and suits the visual format quite well. As for the writing itself, the words play with descriptions nicely. The mouse inhabits a world filled with terms like “dark, dingy den” or “chilly chamber” or “drafty” or “damp”. The cats, in a nice contrast, bandy about with words like “elegant” or “perfumed”. If you were to read this book aloud to a room full of kids without showing them the pictures, they would have little difficulty envisioning where it takes place. I doubt that they’d imagine anything quite as visually stimulating as what von Buhler has conjured up here, though. Combining illustration and models to tell folk and fairytales isn’t a new concept (Lauren Child’s The Princess and the Pea being but one example) but von Buhler clearly takes the notion to a whole other level. Characters in each scene are illustrated two-dimensional figures placed in a three-dimensional world of models and objects. Shooting each scene with her Nikon D300, von Buhler manages to persuade the eyes of her readers that these creatures really have a kind of depth to them. Her choice of layouts also reveals the thought taken for each spread. Where folks like Child will fill entire pages in a book with a single scene, von Buhler likes to shake things up a little. In comparing the cats’ lives to the mouse’s, pages are split into two parts with the cats at the top and the mouse squished into the lower third. Views of individual scenes are sometimes shot from the front and sometimes from above (as when the bat has to distract some Ping-Pong playing cats with a straw hat and cane accessorized song and dance). And the lighting both above and below is remarkable. There’s a tangible warmth to the palace scenes, while you can practically smell the cold stone and musty wet walls where the mouse and bat are forced to reside. The attention to detail goes beyond the sets, of course. Clothing also plays a surprising role in the story. The very first two-page spread is a quickie encapsulation of the old Aesop tale this book takes its title from. In the scene, the mice are depicted as wearing clothing reminiscent of ancient Greece (albeit with fancy pearls). Then you fast forward in time and see the outfits of the mouse and the cats. Since the felines are living off the fat of the land they’re prone to sporting everything from top hats and crowns to preppy hockey wear. The mouse, on the other hand, tends to be garbed in drabber utilitarian fare. Patched sweaters and thick green scarves. And then there are the fonts. Nobody ever pays enough attention to fonts in picture books, but von Buhler sure does. 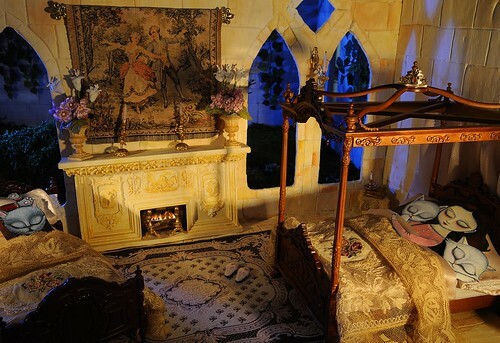 When the text is in the light and airy castle it’s set in the extravagant and fancy Salmiak. Down below where the mouse and bat dwell, though, it suddenly becomes the almost handwritten First Grade. Scale is a little difficult to determine here. The princess appears to be approximately the same size as the cats while the mouse and bat aren’t much shorter, though supposedly they should be small enough to be used as hockey pucks and ping pong balls by the cats. So that was a bit confusing. More sense could be made of the shadows in individual scenes. As a general rule, von Buhler pays close attention to the source of the light in any given scene. For example, when the mouse and bat are discussing various plans in the basement, their light comes from a single candle on a nearby workbench. In these scenes, shadows appear sharply on the dank stone walls. When scenes take place in the slightly more ambient light above in the palace, however, then the shadows dissipate with more frequency. Once in a while a consumer needs a kick in the pants to remind them that picture books aren’t something “easy” than any old celebrity with a pen can write. Some of them take a backbreakingly long time to create and use up more blood, sweat, and tears than anyone might conceivably imagine. It’s only through true dedication on the part of the artist that you get something as visually inspiring as But Who Will Bell the Cats? Beautiful and haunting with the kinds of images kids will pore over, there ain’t nothing like it out there today. A new fable in an all-new style. Copy: Final edition sent from publisher. The book has one heckuva website found here with everything from posters to lesson plans. But that’s nothing compared to the behind-the-scenes info that gives an inside peek at rejected drafts and the process of making these models. And, of course, the mouse is on Twitter. Work in a bookstore? Does it have a cat? Well there’s a Publishers Weekly contest in conjunction with this book where you can win a belled necklace for your kitty. Cute. Hardly any picture book authors gets featured in the Real Estate section of The New York Times. There are some exceptions, however. 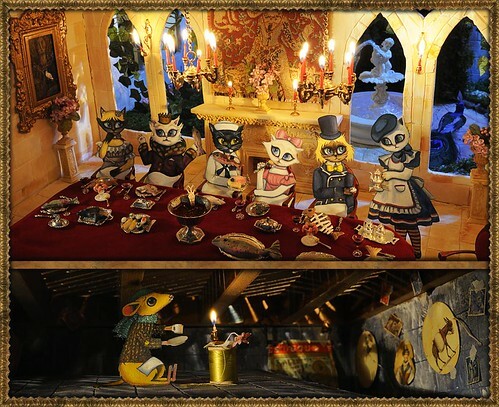 Finally, the MiniArtMuseum at The Nassau County Museum of Art in New York will feature the miniature sets and characters from But Who Will Bell the Cats? and The Cat Who Wouldn’t Come Inside in a solo exhibition from September 20, 2009 through January 3, 2010. More info here. Is there Caldecott potential here? Educated parents rejoice! I definitely hope ths wins a Caldecott. This book is AMAZING! Thanks for the great review, I am forwarding her blog to many of my design-profession friends because it is just so cool! My mind was blown too, and I’m not a four year old! Oh WOW, that blog is amazing. 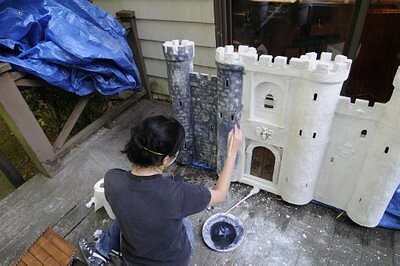 How she had the patience to put together that painstaking level of detail I will never know, but I am so glad she did! Mother of pearl floors in the bathroom!!!! Of a children’s book!!!!! I can’t wait to get a copy of this book. I work in a public school. Last year I selected a book by Madonna, written in spanish, and passed it around the class room. Each child got to take it for an overnight then passed it along. This year, I am going to buy two of these.. one for me, and one for the children! Who will be the lucky child to keep it in the end.. we will see, but Cynthia, again, I think your talent is pretty amazing. I do photography on Staten Island and if ever you need a “favor” just say the word! Great luck to you and your efforts. Pretty wonderful stuff going on here!